Is it possible to cut onions in the kitchen without stinging eyes and looking like you just watched the saddest movie ever? 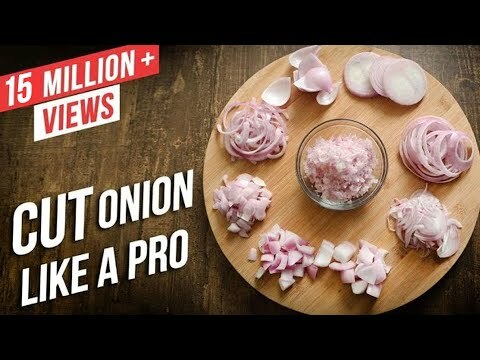 Before we get to the answer, it’s important to know why we tear up when cutting raw onions in the first place. When onions grow underground, they absorb the sulphur from the earth, which creates a class of volatile organic molecules called amino acid sulfoxides. Crushing the onion cells under the pressure of a knife releases the amino acid sulfoxides to form sulfenic acids, which then reacts with the air to create a volatile sulfur compound that wafts towards your eyes. When the gases hit your eyes, they create a burning and stinging irritant in your eyes, and your eyes naturally tear up in an effort to wash the irritating sensation away. The most effective way to cut an onion without shedding tears (other than to buy them pre-chopped) is to wear swim goggles. If the idea of looking like an Olympic swimmer in the kitchen is too silly for you, you can try chilling the onion before cutting, lighting a candle nearby, sticking a piece of bread in your mouth, or running a fan that will blow the onion fumes away from your face. This method seems hard at first, but once you get it down, it makes chopping onions much quicker and less painful. Not to mention, it looks pretty impressive when it’s done right. Before getting started, make sure your knife is sharp. Trying to chop an onion with a dull knife is slow, frustrating work, not to mention a really good way to end up cutting yourself. Before removing the peel, cut your onion in half pole-to-pole (through the root and tip), then remove the ends. Alternatively, you can peel it and remove the ends before cutting it in half, but in my experience the peel comes off much easier once it’s halved. You can find a much more in-depth explanation of different types of dices and chops over on the kitchen. 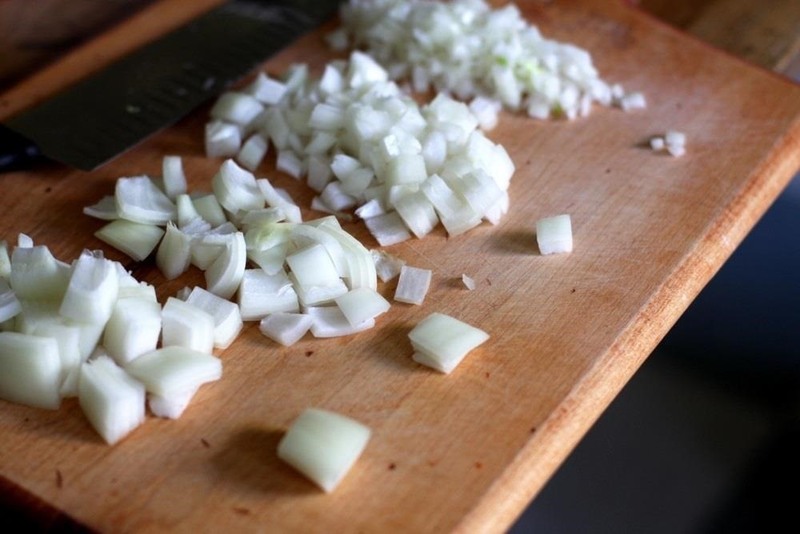 You want to slice almost all the way through, but not quite, so that the onion stays intact while you chop it. Lay your hand flat across the top to hold it in place while you make your cuts. Now, cut the planks into “sticks” by making vertical cuts about the same size as your horizontal ones. Again, make sure not to slice all the way through so you have a piece to hold onto. This is the fun part. Slice across the onion, starting at the tip and making your way towards the root. Keep your cuts about the same size distance apart as your previous ones and watch those beautiful, uniform pieces pile up. Use your knuckles to guide the blade down. Again, this will probably feel pretty difficult the first couple of times, but with some practice you’ll get much faster.